The government's move to scrap Rs 500 and Rs 1,000 notes would be good for the economy in the long run, says Aditya Puri, managing director, HDFC Bank. According to him, the worst is behind us, in terms of long queues and inconvenience, and that the focus should now shift to the advantages arising out of it. “From my perspective, the shock to the system, I think, will give a big boost to digitisation. In the last seven years, the infrastructure for digital financial services — Aadhar, UPI the JAM infrastructure, USSD and micro-ATMs — have been laid down. What, I thought, would take 3-6 years to roll out, I now believe that, with the urgency of the matter, will happen in 3-6 months,” Nilekani said in an interview with NDTV on Monday. Explaining his “theory” further, the co-founder of Infosys said that India is going to see a “massive acceleration of the digitisation of Indian economy for financial services” in the next 3-6 months. Our target of 25000-500 (Nifty 7700-7800) was marked on 30th Sep, and Trump victory and Govt’s denotification has only helped Index moved closer to our target. Remember, this target is based on 60% pattern implication for the channeled Triple Combination rally from Feb’16 low of 22495 to Sep’16 high of 29077. 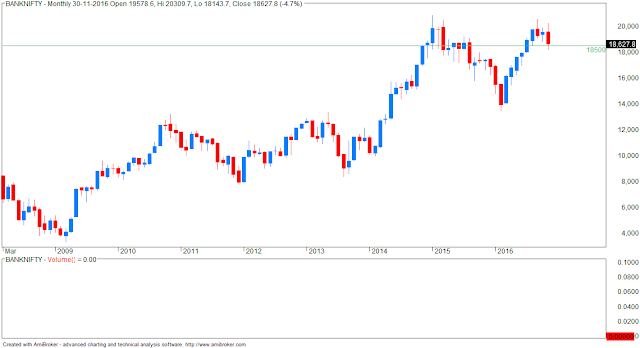 The maximum pattern implication for a Triple can be as much as 70%, which would calculate to about 24500 (Nifty 7500). If the ET does end at these pattern implication level discussed above, then Index could see a major recovery thereafter, either as a new move or as “x” wave with ET completing only the 1st Corrective of the larger correction. 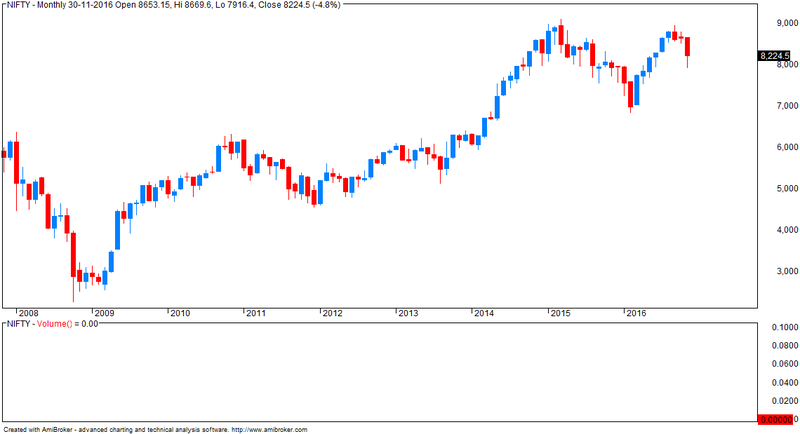 If the Index fails to hold the 60-70% pattern implication, then the larger scenario of 8-year cycle could unfold. As we all know, the year ‘2016 is on our 8-year cycle. 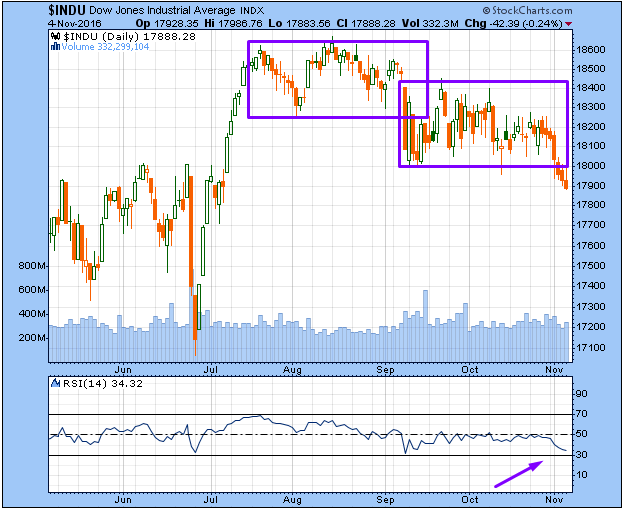 If the Index falls into this spiral, it usually loses 50-60% from the highs. Demonetisation has given a new spur to digital cash and payments, as seen by the huge spike in e-wallet company PayTM’s daily transactions, which have risen three-fold in a matter of days. Yesterday (23 November) we also saw Airtel launch its own payments bank on a pilot basis in Rajasthan, using its own mobile phone network to service customers. It will incur very little additional costs in creating full-fledged branches. Accounts for mobile customers will be opened with a minimum of fuss, with Airtel numbers becoming bank account numbers and eKYC being done electronically. Cash can be transferred free between any two Airtel numbers, and there are 250 million of them. As Nandan Nilekani, former chairman of Infosys and the man behind the Aadhaar Unique ID, which enables this rapid transformation, noted in a presentation (see the full presentation here), the banking industry is set for 12 disruptions. At least six of them are major ones, for which some of the weaker PSU banks are simply unprepared. But you cannot buy food using old notes. 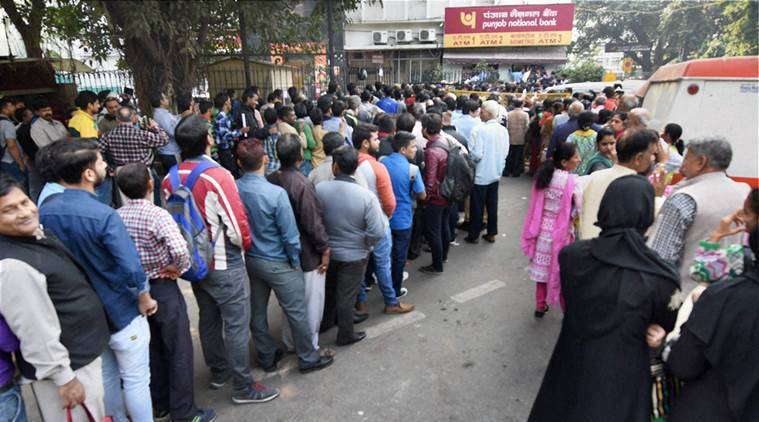 The Bank Employees Federation of India (BEFI) has said currency note shortage will continue for another four to five months even if the country’s all four currency press facilities work at optimum capacity. According to them, the cash scarcity spilling over to next week will make people more impatient when receiving and withdrawing salary will become difficult. “Cash shortage will continue even if the four currency note printing presses run at their optimum capacity. It will take four to five months to restore normalcy in cash supply,” bank employees’ union BEFI general secretary P K Biswas said in Kolkata. Biswas alleged that some customers have vandalised bank property in some of branches of public sector banks and halted banking operations due to cash shortage post-demonetisation. As on March this year, there were 15,707 million pieces of old Rs 500 notes and 6,326 million pieces of Rs 1,000 notes in circulation, the union said. The situation “can turn worse” in a week or so if the customers face difficulties in withdrawing their salaries from banks and ATMs, BEFI said. It said printing ink and dice for new denomination notes have reached the Salboni printing facility in West Bengal, but when the actual printing will start is yet to be known. These are my option writing trades from 1-NOV-2016. Previous trades are posted here. MTM column refers to profit for the day... if net qtty is 0, then it means position is squared off. NOTE: the survey/ poll includes only those people who use smart phones. In other words, the survey does not reflect the views of those people who cannot afford a smart phone. — As of the evening of 22 November, 2016, the app had more than 10 lakh downloads on Android. Given OS market shares in India, all other OSs including iOS cannot add more than another 10 lakh downloads. — The app is available only in six languages – English, Hindi, Gujarati, Tamil, Malayalam, Kannada. Even when one changes language of choice, a lot of the content continues to be in English. — The survey is available on registration only. The registration form is in English notwithstanding the language you choose and it is tedious! One is forced to fill even the voter ID number though like most other forms one can get away with filling in junk data. — After one is done with the form, one can now take the survey. The banner for the survey is in English only. The survey is conducted both in Hindi and English but uses terms like ‘demonetisation’ in Devanagari script. — The survey is available only on the app (our understanding) and not even on the website. An app can be downloaded only by smartphone or tablet users in most cases. IAMAI estimated 371 million mobile internet users in India as of June 2016. — Some of the questions in the survey may be classified as leading. 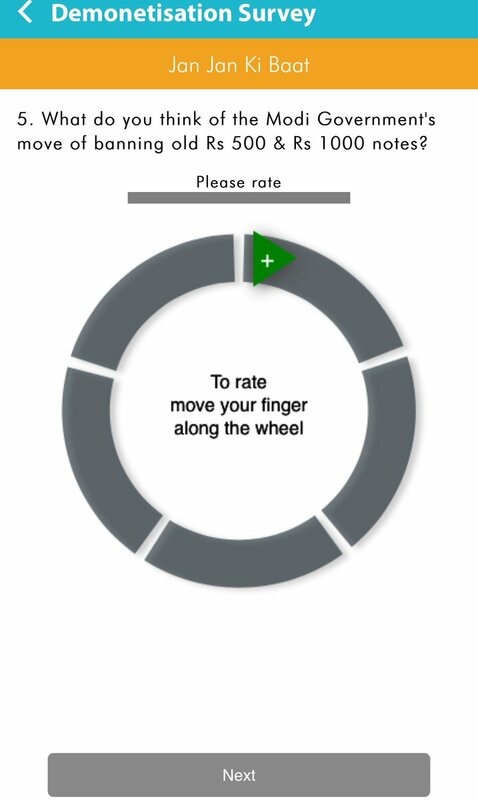 The filling in of the opinion wheel for rating is cool but may not be intelligible to all. 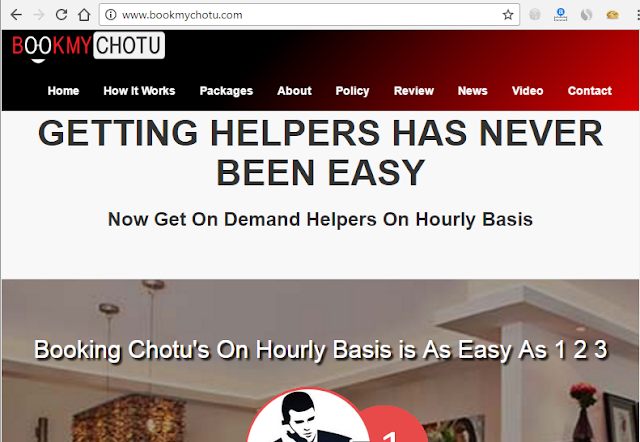 Maids, drivers, nannies, and cooks in India are experiencing unusual politeness from their employers. Beyond the work they do every day, they suddenly have another use – to launder the undeclared cash which the rich have been hoarding in steel wardrobes, under the mattress and in under-bed storage. This sudden outbreak of niceness is the outcome of India's current crackdown on "black money" - income in the form of cash that has not been declared to the tax authorities. On November 8, the day before Sharma's employer became a lamb, Indian Prime Minister Narendra Modi scrapped 500 and 1000-rupee notes to root out corruption and force more Indians into the tax net. Domestic staff and factory employees are going around with big grins, delighting in the panic and anxiety etched on the faces of the fat cats who never showed them any consideration, not to mention the delicious irony of being beseeched by their now squirming masters. Has government bitten more than it can chew via demonetisation? Has PM Narendra Modi bartered graver tangible hit to the economy and masses against little and vague long-term gains? How to weigh the gains and losses of this huge reset minus rhetoric? As dreaded, demonetisation has started radiating its pain across the economy and by and large, Parliament debates have failed to convince the nation on gains and losses of this exercise. It is high time now to take a critical look at this massive disruption. 1) Various independent estimates indicate that around 20 per cent of the black money is in cash possession while the rest is parked in land and jewellery. 2) Demonetisation against the black economy is largely limited to inflicting penalties on those who hold their black wealth in the form of cash at the moment of demonetisation. 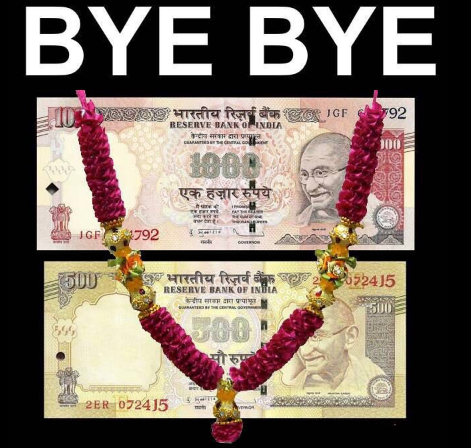 3) Demonetisation has effectively wiped off 80 per cent of the currency in circulation although India trades and spends mostly in high denomination bills. This currency has to come for exchange in banks and other exchange centres. 4) India’s 11.8 per cent of economy deals in cash. India’s cash-to-GDP ratio is more or less parallel to many big economies. Germany’s cash-to-GDP ratio comes in at 8.7 per cent while the same ratio in France is at 9.4 per cent. Japan has 20.7 per cent cash economy. 5) As we know that cash economy is a complex mix of black and white transactions and cash generated through illegal means is also used in the creation of productive assets and demand, let’s give the cash economy a coherent classification. Cash economy consists of two types of cash: accounted and unaccounted. Cash can become legal only when it is accounted either in tax or in the bank account. Whatever cash stays out of these accounts can be called unaccounted or black. 6) Whatever size one may estimate for the black economy, so far as the cash economy is concerned, it is perfectly measured and recorded by the Reserve Bank of India on a quarterly basis. Since the RBI keeps a record of every currency note printed, the data of the notes in circulation is synonymous with the cash economy. Question: How should one go about investments now? How should one go about investments now? Take Asian Paints for example the sector is a bad one now but should one buy this knowing fully well there is fog on the windscreen? the current bias is -ve, and it would continue -ve until the Index can actually start strengthening & closing above previous day. The “e” leg would turn “larger” than “c” below 25400 (Nifty 7860), which is a level exactly inside our month-long downside target of 25000-500 we marked on 30th Sep’16. ...."It has always been a hand-to-mouth situation for us. We are in a precarious position with people postponing construction and renovation activities in the absence of cash," said Kushwaha, who could have earned at least Rs 3,500 from 10 days' work. India's 'de-monetization' scheme has caused chaos across the nation, and while SocGen says the government's plan may have some short-term success in curbing so-called 'black-money', investors should "brace for economic disruption" as Bloomberg reports the Indian government is considering a cap on cash holdings for individuals. As SocGen concludes, "people will now be more inclined to park their black income in gold rather than in currency." Measure planned to prevent people from hoarding cash and generating income that could evade taxes, according to government officials with direct knowledge of the matter. Planned measures include limit on large cash withdrawals from bank, the officials said, asking not to be identified citing rules on speaking to media. Budget, due in February, may have steps to encourage use of checks, credit and debit cards. Purchase of gold jewelry said to be made more stringent to prevent switching of asset from cash. ...“While it takes political courage to launch such a trailblazing and massive campaign; it actually takes far more wisdom to give it a happy ending,” an article in the state-run Global Times said. “Given the fact that people have to pay an absurdly high price for the expected reform, if BJP fails to deliver its high-sounding rhetoric and promises, then Modi’s much-lauded ‘masterstroke’ or ‘big bang reform’ will likely be reduced to ‘nasty partisan conspiracy’ and even a ‘costly political joke’,” it said. Will The Cash Crunch Cause The Indian Economy To Contract? ...But yes, you have this problem right now that people aren’t transacting. They’re holding off buying new clothes. For that can wait. They’re saying, yes we need new taps and bedsheets but wait till the cash situation is better. They have money, which is now in their bank account because they had to deposit it. But they have no money because the medium that they use for transactions – cash – is crippled. Even if it’s temporary, they will choose to wait. And that causes a ripple effect on everything in the economy (well, most things) which runs so much on cash. People buy toothpaste and chips and juices and all that, but now they’ll buy just the essentials – toothpaste. Sales get slower. That’s okay, you think, the sales come back after a while. But the problem lies within. The FMCG companies that deliver to shops work mostly on restocking. You bought X quantities of chips, it usually goes away in 2 weeks, and you’ll need more. So every 2 weeks, we’ll send you chips. Except now, those 2 weeks are becoming six weeks. “Fast Moving” consumer goods become not-quite-so-fast. Stuff stocks up at warehouses, and factories then cut down production. Here's another bit of unwanted change the demonetisation drive has handed the common man, only this time around, it is to vegetable farmers in the state. The drive is forcing them to either dump their produce or sell it to agents at a loss. Traders from the APMC market say if lower denomination currency is not made available in the next few days, then the situation will be grim. In Akola, farmers who were to cultivate their cabbage and cauliflower for sale are finding no traders to sell them. mid-day spoke to Yogesh Godse (30), a farmer who hails from Lahit Khurd village in Akola. He has cultivated cauliflower in his over one-acre of farmland and also sells his produce through the APMC market in Vashi. Godse said, "A day before the Prime Minister announced the demonetisation, the traders would buy cauliflower at Rs 15 per kilo, then it dropped to Rs 9 and today only a handful of traders visit the market and quote their rate, which at present is Rs 3 per kilo, which doesn't not even cover our costs." Godse said he cultivates around 10,000 to 12,000 kilos of cauliflower this time of the year. Amol Shivdas (29), another farmer from the same village said, "We used to sell cabbage at R8 per kilo and today due to lack of demand from the traders, we are not even able to get Rs 3 per kilo. These are perishable products but since it is winter, they can remain fresh for three to four days. But after that it is a waste and we have to feed our cattle, we cannot even think of selling our produce at such a lower rate." "There are no takers for our vegetables and as traders and customers don't have smaller denomination currency, the demand has fallen and we have to incur heavy losses," said Shivdas. With the passing of the Benami Transactions (Prohibition) Amendment Act, 2016, Modi now has the statutory powers to go after property crooks, most of whom are either politicians or realtors connected to politicians. The law is draconian and it can be used to confiscate benami properties. Demonetised money can be laundered sometimes, but confiscated property is gone forever. Under the law, once the government sets the process in motion, an initiating officer will serve a notice on the benamidaar and take the property under his control. An adjudicating officer will then examine all documents and evidence and pass an order on whether to confiscate the property. Once the property is confiscated, it will be managed by an administrator till a further course of action is prescribed against the offender. What will further strike fear in the minds of beneficial owners and benamidaars is the provision of a jail term and massive fine if found guilty. The amended Act provides for prison terms of up to seven years and fines of up to 25 per cent of the fair market value of the confiscated property. 1. Banks will benefit, as much of this 15 lakh crore in currency will get deposited. Even if only 10 % remains with the banks it means an incremental 1.5 lakh crore of current and savings account ratio (CASA). Interest rates are headed lower system-wide as banks’ cost of funds decline, they lower rates and park these flows into government paper. 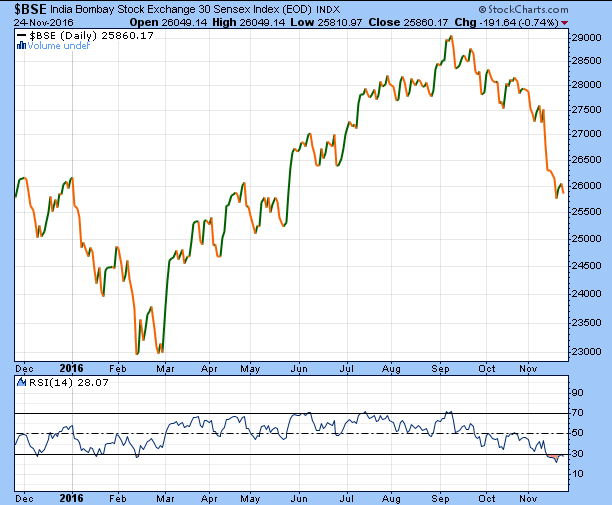 Already we have seen Indian 10-year yields fall by 40 basis points in the last week, despite yields rising globally. Also remember this money left with the banks will have a multiplier compared to it sitting in cash. The system should be awash in liquidity. 2. 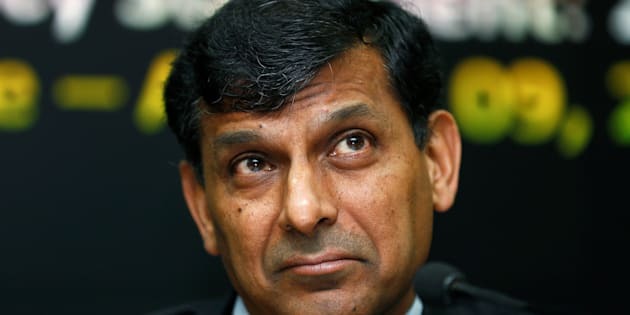 The Reserve Bank of India (RBI) will cut rates sharply and quickly. This reduction in currency will be a deflationary shock, with certain asset markets declining sharply and economic activity weak for the next two quarters at least. Inflation will decline giving the RBI the space to cut. 3. Financialisation of savings will accelerate as both property and gold will now be challenged as alternate stores of value. The cost of capital will reset downwards for the country. 4. There will be a significant negative wealth effect. Some percentage of this ₹ 15 lakh crore will get wiped out. Black money that is either simply burned, or loses 30-40 per cent as the cost of conversion to legitimate money. Wealth destruction is also inevitable in property, as prices fall and markets freeze. There will be a shock to high end-discretionary consumption. 5. There is likely to be some behavioural change as those parts of the economy relying on cash need to adjust. Individuals and business that were using large chunks of cash on a daily basis will take months to rebuild these cash levels given the limits on daily withdrawals. In the interim, they will have to adopt e-payments or cheques to stay in business. As their business moves into the formal economy, it will be difficult to reverse and the tax buoyancy of economic growth will improve for the government. 6. For the vast majority of Indians, those having less than ₹ 2.5 lakh in cash or agriculturalists, things will normalise in a few weeks. They will simply need to wait till they can get the new notes. For these people, it is largely a logistical issue of note replacement. 7. Small and medium-sized enterprises (SMEs) will be in trouble. Many are doing business entirely in cash. Demonetisation, combined with goods and services tax (GST), will kill their business model, which was dependent on tax and labour arbitrage. Many sectors will see large market share gain for the organised players. Lenders to the unorganised sector will need to stress test their exposures; there may be far greater credit issues here than investors are modelling. 8. Expect more measures to tackle the flow (fresh creation) of black money. Demonetisation handles the stock problem. Once the short-term logistics around cash replacement are fixed, expect new restrictions on use of cash and continued curbs on cash withdrawals. These steps will continue to force behavioural change. 9. I am frankly quite amazed as to the extent of cash in the system and its all pervasiveness. It seems that there is no supply chain untouched, and even large organised players need to deal with cash. There are many segments of the economy which operate only on cash. Whether demonetisation works or not, we have to attack this cash and the mindset. That much is certain. Gold coins will overtake currency notes in financing large black deals. This will hugely increase the demand for imported gold, causing balance of payments strains. A 5g gold coin today is worth roughly Rs 15,000, and a 10g coin roughly Rs 30,000. So, a briefcase of gold coins will hold several crores, far more than a briefcase of Rs 2,000 notes. Portability and space reduction make gold more convenient for large deals. Bribes are often a percentage of project costs, and as the economy and projects grow bigger, kickbacks will too. Large payments will be done most conveniently in gold or dollars. Gold is usable anywhere in the world. Not being paper, it can never be demonetised. Cash keeps losing real value because of inflation, but gold prices rise faster than inflation in the long run. If rising demand for gold induces the government to raise the import duty, domestic prices will rise correspondingly, giving a windfall to gold holders. The value of gold fluctuates daily, creating valuation risks for hoarders. However, holding cash is not riskless either because it depreciates with inflation. Cash only depreciates, whereas gold coins can both depreciate and appreciate, mostly the latter. That’s why the future of black is gold. Many naïve folk think demonetisation will deal a body blow to black money and shift India towards a clean, cashless economy. Sorry, but the benefits will be limited. Black money is both a stock (that is, a hoard of past untaxed money) and a flow (the constant generation of fresh untaxed income). 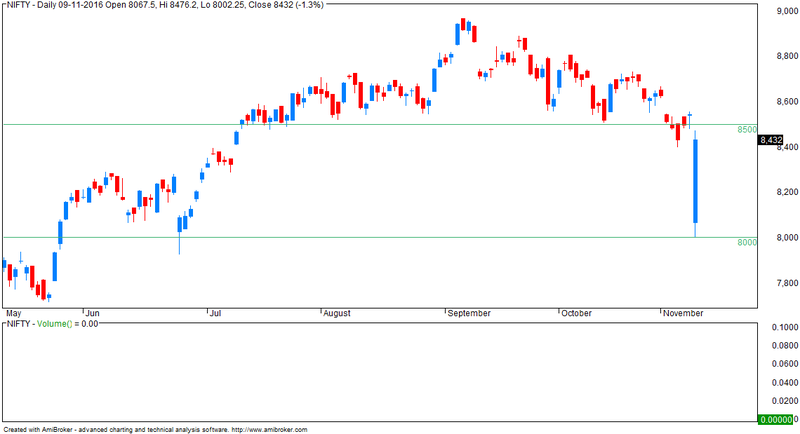 Nifty opened gap down on Friday at 8456 and traded with negative bias for rest of the day. Nifty declined more than 230 points before closing 229 points down at 8296. It was again a big range day with huge gap down. 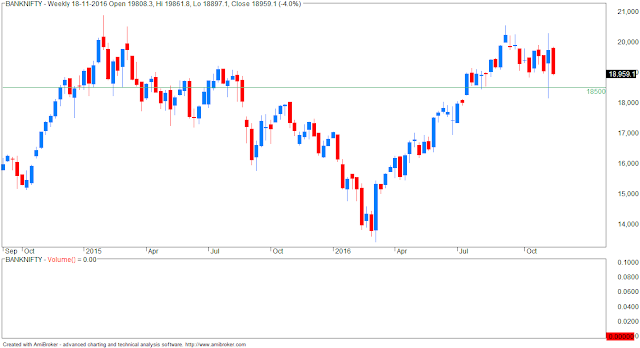 Yesterday, 8437 was the breakeven point and Selling was suggested if break or open below 8437 using stoploss of 8467 expecting minimum targets 8368-8348 and further even touch of 8347 can initiate further decline towards 8177. 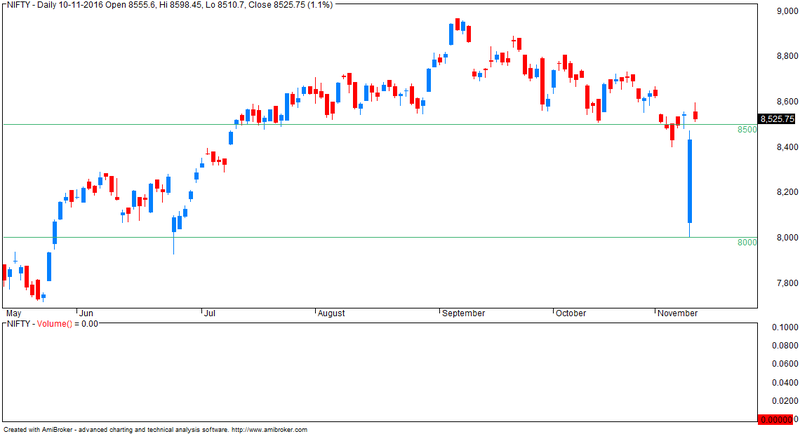 Buying was advised only after seeing 38% retracement/bounce of whole decline from 8598. Nifty broke below 8437 and decline towards 8348 without touching stoploss 8467 followed by break below 8348 later in the day. Let’s have fresh look a latest charts for further scenario. What happens when you have 24 different explanations for the same thing? 1. They believe they are smart and well-informed. 2. Their good judgement told them Trump is OBVIOUSLY the next Hitler, or something similarly bad. 3. 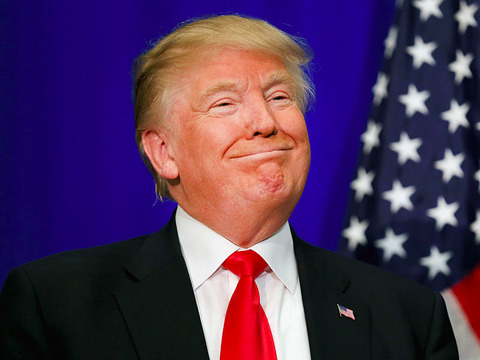 Half of the voters of the United States – including a lot of smart people – voted Trump into office anyway. - no clear or visually obvious trend visible. Trend is down on weekly charts. Next support is at 40000. Holding above 45000 will be bullish. Weekly charts are showing trend reversal. 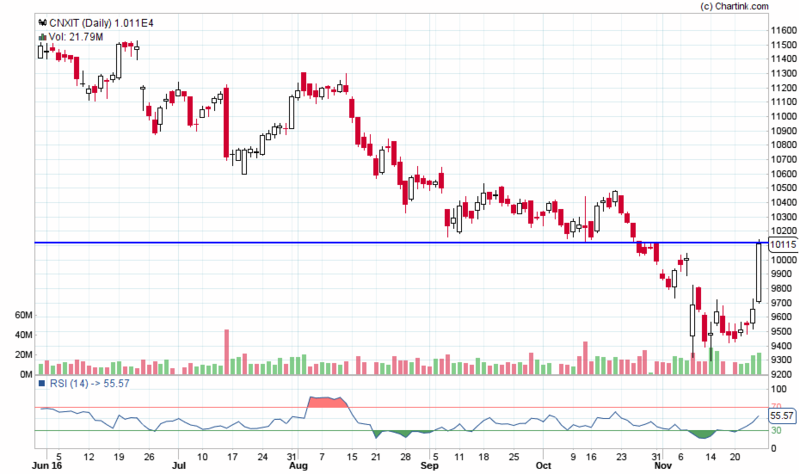 Next support is around 28000 and then 25000. Reading lots of interesting / divergent views on this topic with no explanations being offered on how to identify if something is oversold or overbought. 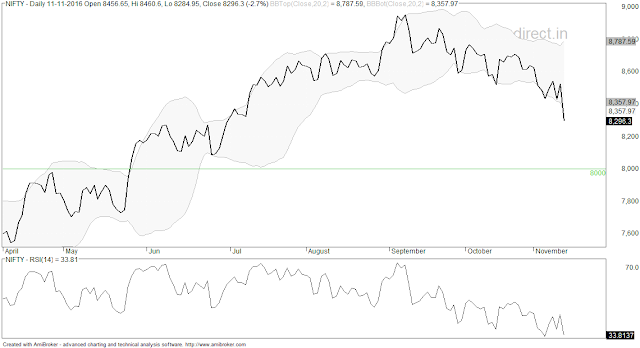 Here is the chart with RSI set at 14... note this is a line chart which considers only the closing. 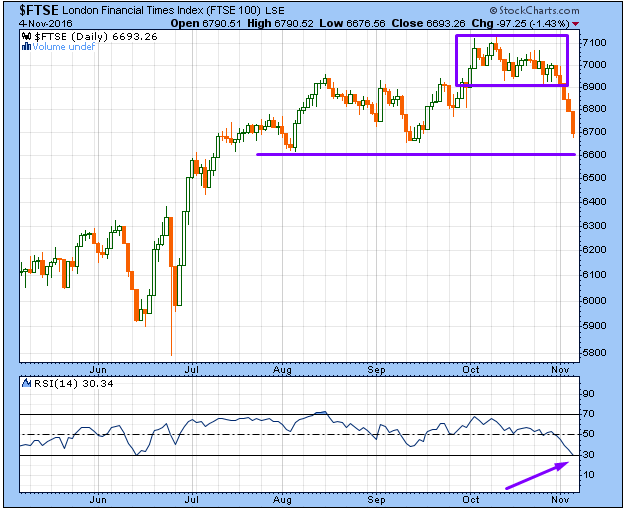 NF is certainly looking weak on 14 day RSI chart but is near double bottom support. The RSI value is 34 but for oversold reading it should go down to 20. 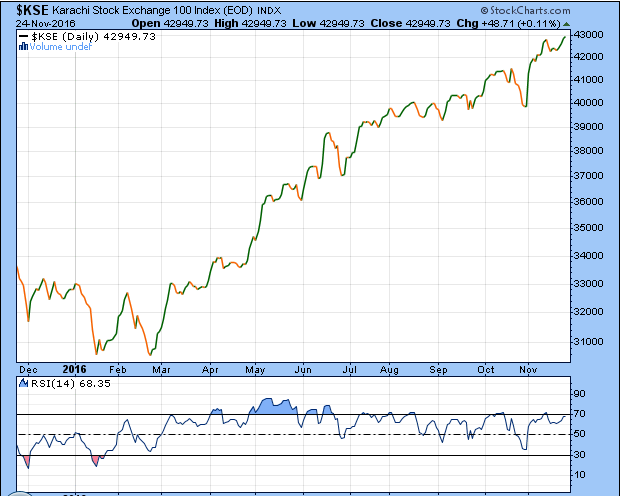 Note that in strong corrections, a stock or index can remain oversold for extended periods of time (and vice versa). 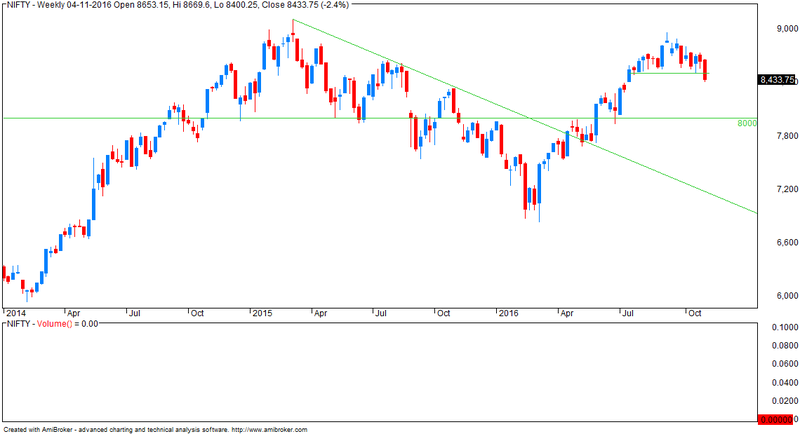 Summary: trend is down since mid SEP (line chart) ... reversal level is close above 8600. Disclaimer: I do not use these indicators.... this post is to clarify questions I receive via email. No. Clinton’s team of cognitive scientists and professional persuaders did a terrific job of framing Trump as scary. The illusion will wear off – albeit slowly – as you observe Trump going about the job of President and taking it seriously. You can expect him to adjust his tone and language going forward. You can expect foreign leaders to say they can work with him. You can expect him to focus on unifying an exhausted and nervous country. And you can expect him to succeed in doing so. (He’s persuasive.) Watch as Trump turns to healing. You’re going to be surprised how well he does it. But give it time. I am not quite sure if what you meant is demonetise the old notes and introduce new notes instead. In the past demonetisation has been thought off as a way of getting black money out of circulation. Because people then have to come and say "how do I have this ten crores in cash sitting in my safe" and they have to explain where they got the money from. It is often cited as a solution. Unfortunately, my sense is the clever find ways around it. They find ways to divide up their hoard in to many smaller pieces. You do find that people who haven't thought of a way to convert black to white, throw it into the Hundi in some temples. I think there are ways around demonetization. It is not that easy to flush out the black money. Of course, a fair amount may be in the form of gold, therefore even harder to catch. I would focus more on the incentives to generate and retain black money. A lot of the incentives are on taxes. - trend remains down ... till it reverses. - why do they expect 8000 not to break? when we are already at 8500? 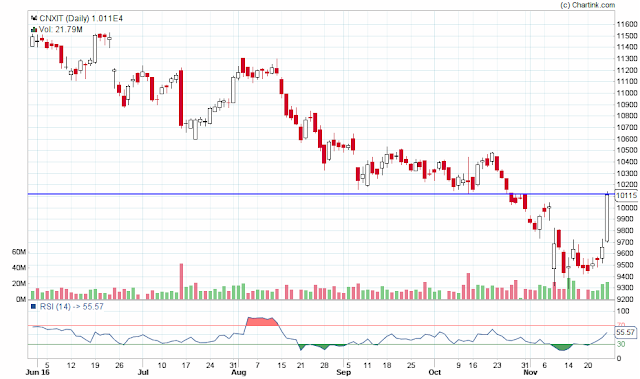 - Why not 'expecting support' at 8400 or 8200? 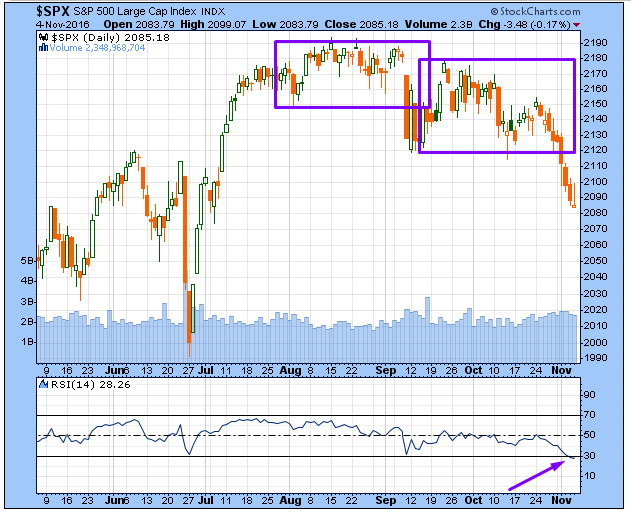 - so what is the market trying to tell us? Today we had what I like to call a "master candle". This is a candlestick which is large in size or has a tall body and the very formation tells you a lot of what has happened. In any master candle, the high and lows are extremely important... in the current context, the low is very important as we had a severe gap down and a very strong rally afterwards. 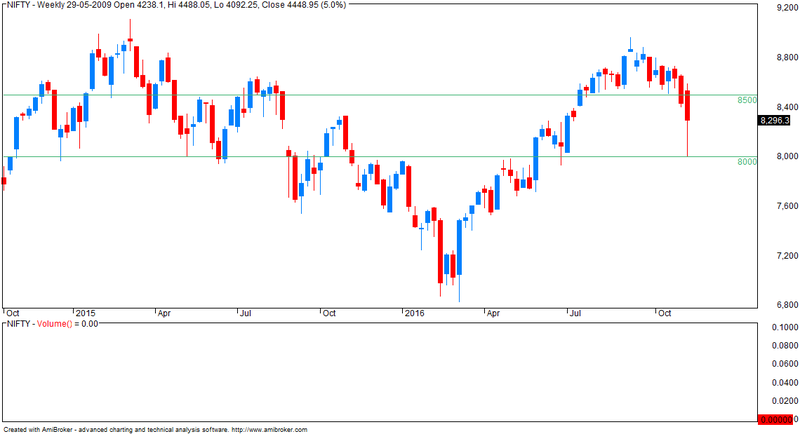 It is normal for markets to consolidate or do timepass within the high/ lows defined by the master candle. These are sometimes easy to trade - sometimes not. 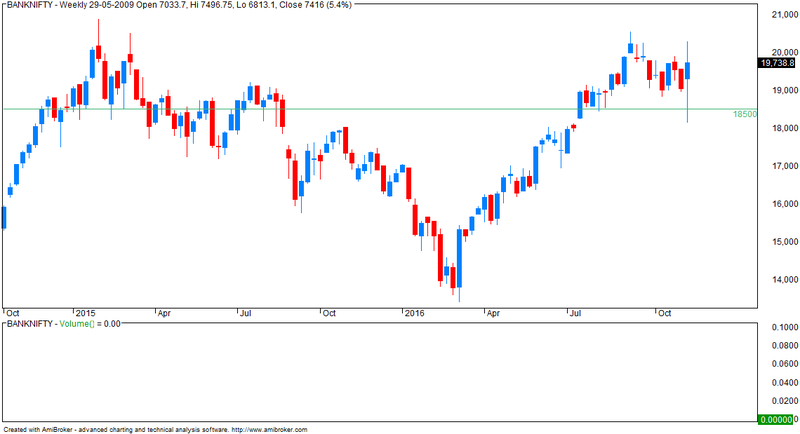 Let us see how markets pan out this time as the volatility caused by this candle has to fizzle out over a period of time. In our current context, we also have to note that 8500 broke decisively and while this level offered very good support in the past it will now offer resistance. - initially down almost 4%, markets closed 1.3% negative and close was near day's high. 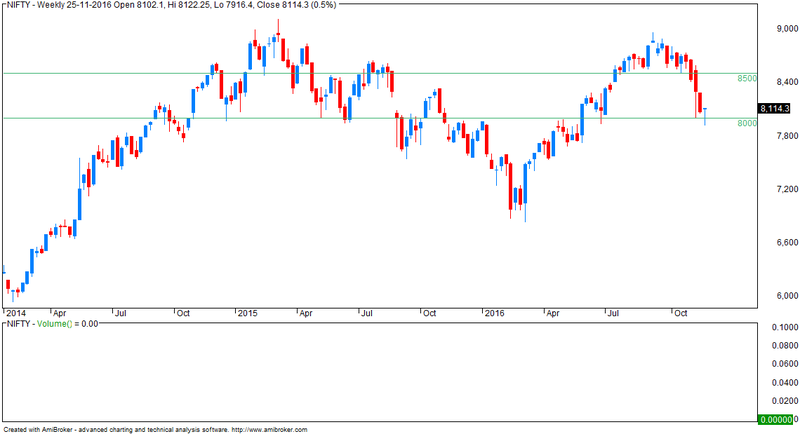 All these stocks can be considered for buying only on close above their recent highs / last month's high. Limit risk per trade to less than 1% of your capital. 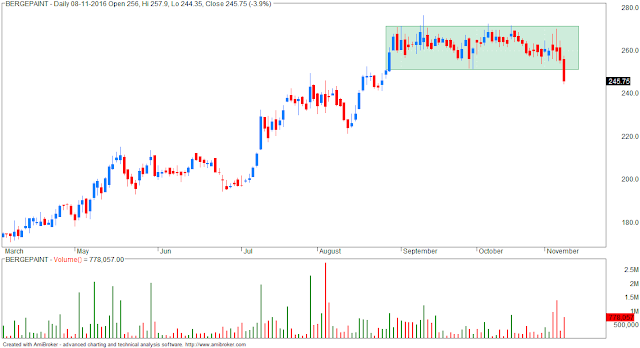 - contra view: NF trading in falling channel breakout from which will be bullish. The FBI has not revealed the exact process by which it sifted through all of the relevant emails. But most experts agree that the agents probably didn’t even need the full eight days to do so. “Given those emails, and a list of known email accounts from Hillary and associates, and a list of other search terms, it would take me only a few hours to reduce the workload from 650,000 emails to only a couple hundred, which a single person can read in less than a day,” cybersecurity consultant Rob Graham wrote in a blog post on Sunday. Apart from the election, all other stars seem aligned for a rate hike. The IMF gave the Fed a green light in terms of emerging-market expectations. Persistently dovish voices such as Charles Evans of the Chicago Fed and Lael Brainard, a Fed governor, have either been supportive of a rate hike or have remained silent lately. 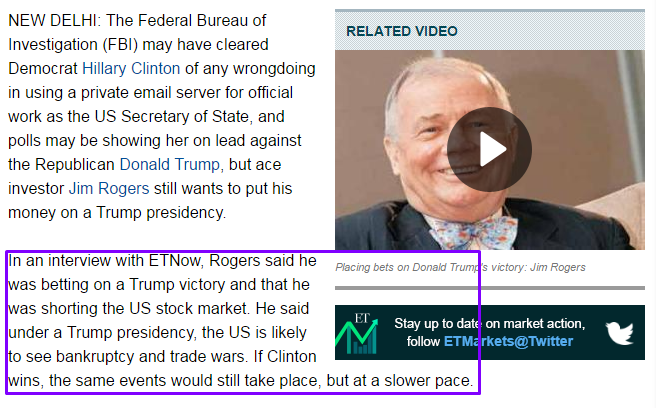 The only thing that could throw the Fed off this path would be if a 10% stock market correction from a Trump win turned into a 15% or 20% collapse with global contagion. However, I expect that once the 10% correction is over, investors will take a second look at Trump’s policies of low taxes, less regulation and big infrastructure spending and like what they see. This means stocks may stage a post-election rebound soon after any correction. But for now, a December rate hike is in the cards and almost nothing can stop it. 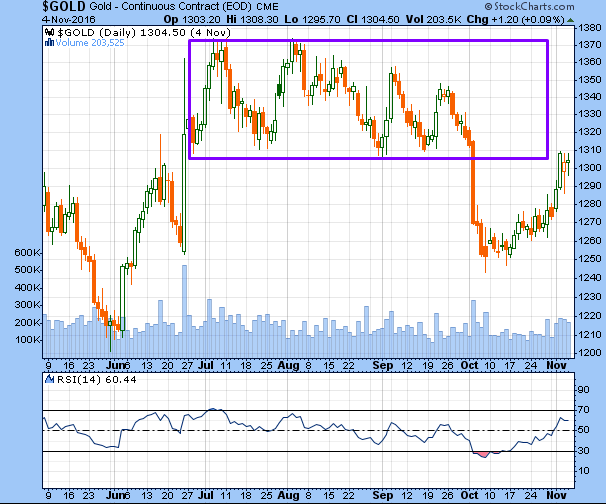 GOLD - previous support to now offer stiff resistance? ...We also suspected maturity as the “D” leg as it was a Triple Combination Corrective and Index was already forming its 3rd Corrective, which is always the last Corrective of any Complex development involving x-waves. We, remember, assumed that Index was forming a Neutral Triangle since Mar’15 onwards, as shown on the following chart. If its “D” leg is over, as described above, its last leg “E” would go down. In case of Neutral Triangle, “E” can tend towards “equality” with “A” leg from Mar’15 to Jun’15. 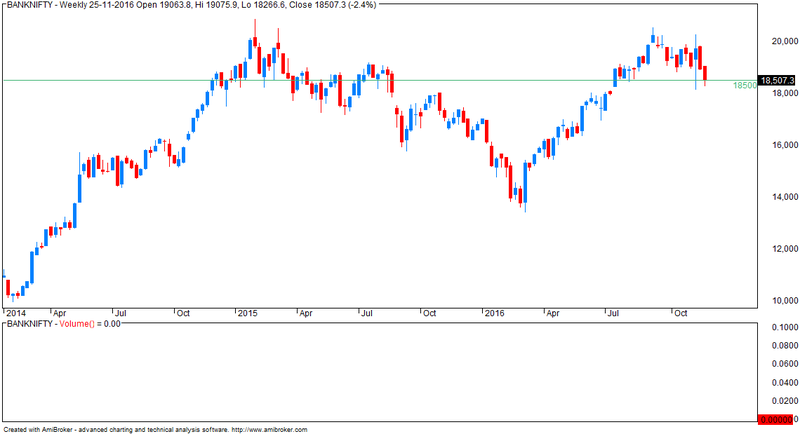 If so, then such equality would also calculate levels projecting 25000-500 (Nifty 7700-7800). Equality of “E” to “A” could be time-wise as well. Since “A” consumed 3 months from Mar’15 to Jun’15, “E” could complete by Dec’16, i.e. in 3 months. 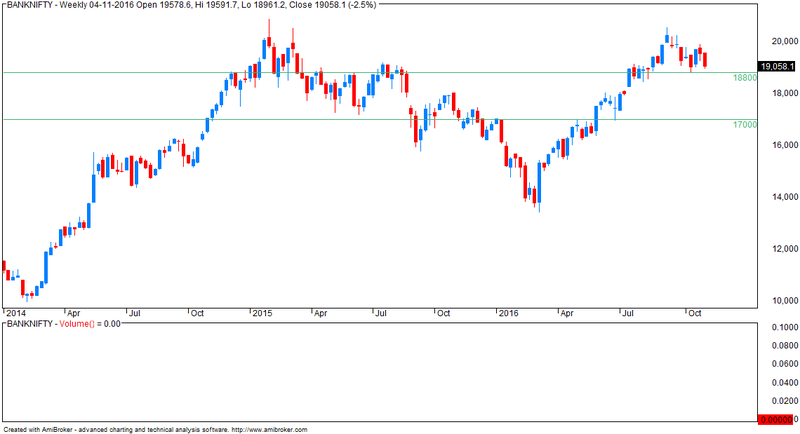 Nifty opened mild gap up at 8504 but again failed to sustain at higher levels and trader with negativity for rest of the day. 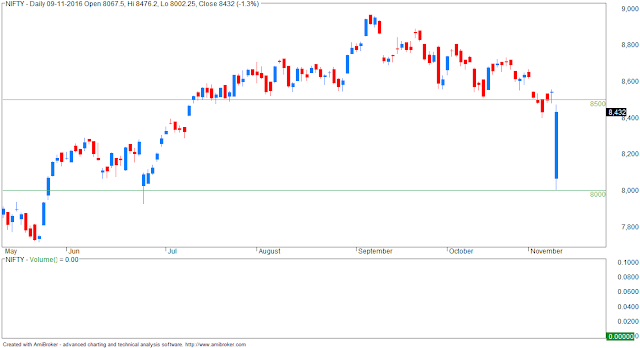 Nifty declined gradually to register day’s low 8400 before closing 51 points down at 8433. Friday, suggested buying Nifty only if trades above opening price at 9:31 AM (after first 15 minutes) otherwise more decline was expected. Nifty opened at 8504 but failed to trade above 8504 at 9:31 AM and declined till 8400. Nifty 8900-9000 calls bought in light quantity in 45-27 range 2 weeks back is near to Zero and this trade is almost failed. Let’s have a fresh look at latest charts for further scenario. 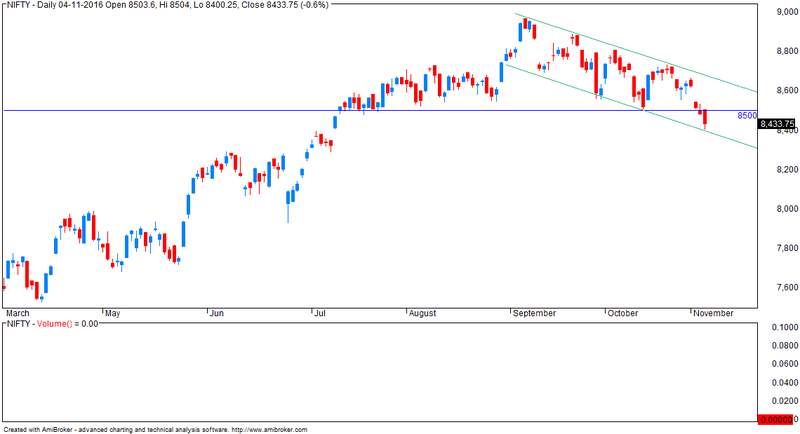 - on bright side, markets still trading withing falling channel. Is there a television on nearby turned to CNBC, Bloomberg TV, or any other financial news channel? If so, please get up and switch it off. Now. Don’t worry, I will wait here for you . . . The people working at Bubble TV and their counterparts at financial newspapers, investment newsletters, etc., are not in the business of providing good advice. They are in the business of selling airtime, newspapers, and newsletters. And the best way to attract attention is to appeal to the emotions and instincts of their viewers and readers. “If it bleeds, it leads” is an old saying in the news business. Spectacular earnings surprises and cratering stock markets generate more viewers and readers than stories about meeting earnings expectations and stock markets grinding their way up. “Experts” who want to be mainstays on Bubble TV have to entertain. And it is much easier to accomplish that by stoking people’s fears of a crash or their desire to get in early on the next superstar investment. As a result, Bubble TV is full of “news alerts,” “breaking news,” and pundits predicting imminent doom or eternal bliss — often both at the same time. By analysing self-reported personality scores for what are known as the "big five" psychological traits - openness, conscientiousness, extroversion, agreeableness, and neuroticism - researchers have created an algorithm which can accurately predict personalities simply based on Facebook interactions. And, surprisingly, it knows your character better than your close friends. The team found that their software was able to predict a study participant's personality more accurately than a work colleague by analysing just 10 'Likes'. Inputting 70 'Likes' allowed it to obtain a truer picture of someone's character than a friend or room-mate, while 150 'Likes' outperformed a parent, sibling or partners. It took 300 'Likes' before the programme was able to judge character better than a spouse. Lead author Wu Youyou, from Cambridge University's Psychometrics Centre, said: "In the future, computers could be able to infer our psychological traits and react accordingly, leading to the emergence of emotionally-intelligent and socially skilled machines. 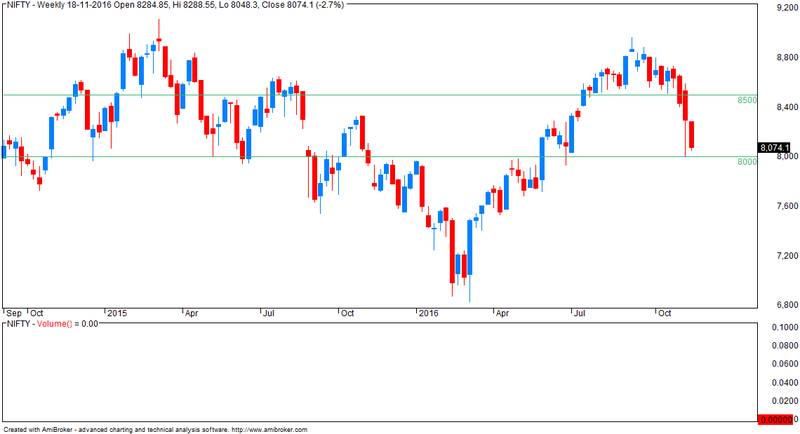 ....we need to watch near Aug’16 low of 27628 (Nifty 8518) once again. Remember, Index has been holding roughly around this level for as much as 3 months. So, we must monitor this crucial support. Indeed, as we have been mentioning, we need to see Index making “lower top lower bottom” below its Aug’16 lows to finally confirm that the 3rd Corrective, and therefore, the larger “D” leg from Feb’16 is over. We also suspected maturity as the “D” leg as it was a Triple Combination Corrective and Index was already forming its 3rd Corrective, which is always the last Corrective of any Complex development involving x-waves. Nifty opened gap up on Muhurat trading at 8672 but failed to sustain at higher levels and declined straight way to register day’s low 8616 before closing 12 points down at 8625. On Sunday, Nifty opened gap up as per expectations but failed to sustain at higher levels and trailing stoploss of 8631 triggered. Nov 8900-9000 Calls in light quantity were suggested to hold without stoploss. Let’s have a fresh look at latest charts for further scenario.